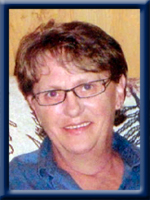 MERRY – Phyllis M., 60, of Milton, Queens County, passed away peacefully in Queens General Hospital, Liverpool on Monday, November 11, 2013. Born in Liverpool, she was a daughter of Amy M. (MacNutt) Tufts of Caledonia and the late Gordon Tufts. Phyllis enjoyed her flower gardens while her furry angel, Muffin, sat by her side. Her other hobbies were camping, crafts and dipping fish.. She enjoyed baking and cooking, with one exception, Dave ate it faster than she could make it. She is survived by her companion of 27 years, David Mansfield; her daughters Rachel (Laurie) Joudrey of Middlefield, Melissa Merry (Glen Cunningham) of Kempt, her son Wilson (Kelly Mundorf) of Grande Prairie, AB. Grandchildren Aiden Merry, Rebecca, Cameron, Venessa and Brandon Cunningham, Abagail and Logan Joudrey. Her sister Hilda Simpson, New Germany, her brothers Allan (Madelaine) of Westfield and John (Ronna Young) of Harmony. Phyllis was predeceased by her brother St. Clair. To the Family of Phyllis with Heavy Hearts we would like for you all to know that we are thinking of you all at these hard time . Phyllis was a very nice lady and we are very sad to hear of her passing may she R.I.P as she is Home at last. To David and family. Sorry to hear of Phyllis’s passing. She was a really good friend and will be missed very much. We are thinking of you at this hard time. Keep your spirits up as you know she would want you to. So very sorry to all the family for your loss. Im sure you all have wonderful memories that will keep her in your heart forever. Sorry to hear of your loss . I remember your mom from school and always thought alot of her. Whenever we happened to see each other we always had to chat and catch up on each others family. You will always have the memories and pictures of her and will forever carry her in your heart. She will always be with you . Sending our condolences to you and your families at this time. So sorry to hear about Phyllis, thinking of you in your time of sorrow, Always remember the good time and she will always be close. I was so saddened to hear of Phyllis’s passing. I have worked with her for years and I can truly say that she was a good friend of mine. I will miss her beautiful smile and her laugh. And to her children she would tell me all about you guys. She thought the world of you all. Please know that you all have my deepest sympathy and know that you do not morn alone. Sincere sympathy. Our thoughts are with you. To Phyllis’s family just to let you know that you are in my thoughts at this sad and difficult time.She was an amazing lady and now she is at peace..Remember all the special time that you spent together and with family and friends to help you get through. Sincere sympathy to Phyllis’s family. Thoughts and prayers are with you at such a difficult time. God bless. Our sincere sympathy to all the family, our thoughts & prayers are with you at this very difficult time. Sincere sympathy to you & your family at this sad time. David and family: Our thoughts and prayers are with you all at this sad time. Our hearts are saddened at this most difficult time in all your lives. May God comfort and keep you safe as you remember the fond memories of your mother. She was a great lady and mother. Our thoughts and prayers goes out to your family. Your mom is pain free now. So sorry for your loss. Hold onto the memories and cherish them. Sincere Sympathy to all of Phyllis’s family.Our thoughts and prayers are with you during this sad time. David we are so sorry to hear, our thoughts and prayers are with you. Angel and you will all meet again someday. Take Care. You are all in our thoughts and prayers. Please accept my heartfelt sympathy at this very difficult time. Phyllis was my ” best friend ” in high school. I will treasure the memories of the visits to her home, the secrets shared between us as teenagers that only best friends could share, the many laughs , and trying to make me understand that damn math.. I was honored to have known her and of having her as a next door neighbor for years. Goodbye my dear friend. Wilson , Melissa ,and Rachel and family. There are no words that can explain how you are all feeling now . The pain that you are having now will easy in time and all your memories and love you have for her will take over .She is with her Dad and Brother and I know they will take good care of her .Take comforted knowing that She is in God’s arms and pain free . My heart goes out to all of Phyllis’ family. My thoughts are with you. so sorry to hear of your loss. our thoughts are with you at this difficult time. Wilson, Melissa, Rachel and Families; Sad to hear of your mother’s death but now she suffers no pain while she awaits the fulfillment of the scripture at John 5:28,29. It speaks of her future resurrection. Please take courage. Our sincerest sympathy. Del & Mary. So sorry to hear of Phyllis’s passing and will surely miss talking with her. Our thoughts & prayers are with you all at this sad time. We are sadden to hear of Phyllis’s passing. To David and families we offer our thoughts and prayers to you and the happy memories of Phyllis brings you comfort. so sorry to hear about phyllis’s passing may she rip .god bless you all. Our sincere condolences to you in this time of great sorrow. May God comfort and keep you. Rachel, I was so sorry to hear about the loss of your mother. I know how special she was to you and how important family is. You and your family are in my thoughts. My prayers and thoughts are with david and the Family during this sad time,you all have so many memories that you can share about her cherish them and she’ll live on forever in your hearts. Dear David, Rachael and family. So saddened to hear of Phyllis passing. We send our love and prayers to you all at this difficult and sad time. And ask God to comfort you and to know that He is there for you in the days ahead to come. Thinking of you Jeff and Angela. I would like to extend heartfelt sympathy to the family of the late Phyllis Merry. I am very saddened to hear of your loss. May the peace that comes from the memories of love shared, comfort you now and in the days ahead.